A photo ramble today in Uplands Park – March 21-2015. Fawn Lilies and Shooting Stars in bloom everywhere. The first Camas & Buttercup flowers appearing. So green and so wet. So beautiful. Our Friends of Uplands Park wordpress blog/website has used up it’s free space allocation, so until we decide what to do, future postings will be without embedded photos. of Willlows Beach in Oak Bay. After observing sea and shore birds, we will head inland into the park to observe the many wintering birds in this fabulous Garry Oak Meadow Community. Did you know that 22 species of endangered species of plants are to be found in this park? Many thanks go to the numerous people who, over the years, have put in so many good efforts to remove the invasive species that compete with them. 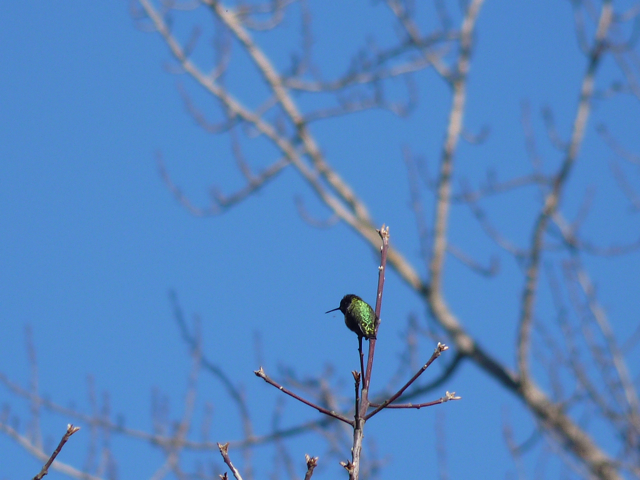 Hummingbird photo by Wayne Matthews during the February 2015 Bird Walk in Uplands Park.